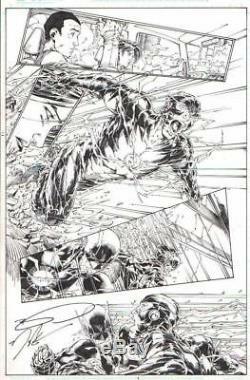 A beautiful page of 2014 Flash original art by stellar comic book artist Eddy Barrows! This is the original art to The Flash # 34, page 19 and features Future Flash, Reverse Flash (Daniel West), Iris West, Wally West. On this page: Iris and Wally are heartbroken over the crimes of Daniel West (Reverse Flash) while, 5 years in the future, Future Flash decides to deal with the problem of Reverse Flash once and for all! See color scan of published page for more. The art on this page was penciled by Brett Booth and inked by Norm Rapmund! Brett and Norm have signed the art on the bottom left side of the page! Signatures are authentic and were obtained in person PLEASE NOTE: This is an original, hand drawn piece of published Flash art, not a print, copy or facsimile! This 11 X 17 inch page of art on bristol board is in excellent condition and would make a great addition to any Flash, Future Flash, Reverse Flash (Daniel West), Iris West, Wally West, Brett Booth or Norm Rapmund collection! It could also make a GREAT GIFT! These charges are the buyers responsibility. And, check out my other auctions for great original comic book art! 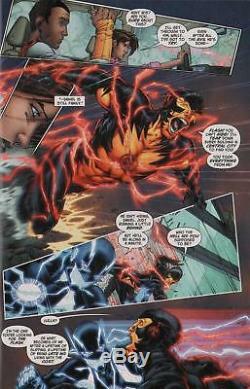 The item "BRETT BOOTH 2014 FUTURE FLASH VS. REVERSE FLASH ORIGINAL ART-FREE SHIPPING" is in sale since Sunday, October 15, 2017.